Nielsen Digital Ratings (Monthly) data for July 2017 saw more Australians consuming current events and global news content with a unique audience of 13.4 million, up one per cent when compared to June 2017. News.com.au retained the top position with a unique audience of 5.9 million, an increase of 11 per cent compared to the previous month. In second place was ABC News websites (4.7 million, up three per cent) which switched places with nine.com.au (4.5 million, down four per cent). 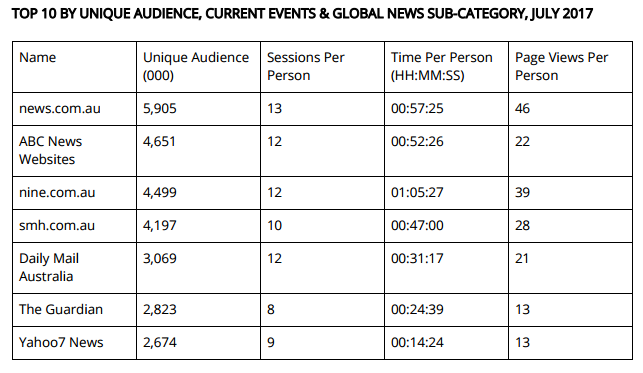 Ranked fourth in Nielsen’s digital data was smh.com.au (up 12 per cent), fifth was Daily Mail (no change), followed by The Guardian (up four per cent), Yahoo7 News websites (up four per cent) and BBC (no change). The Daily Telegraph moved into the top 10 rankings in ninth place with a unique audience of 2.3 million (up five per cent), followed by Herald Sun in 10th place with a unique audience of 2.3 million (down two per cent). For the top 10 news entities reported in digital Ratings (monthly), Nielsen’s Digital Content Ratings found that the unique audience was consistently highest on Fridays for the month of July 2017. In addition, Nielsen’s Digital Content Ratings data revealed that news.com.au reported the highest average daily unique audience during the month of July 2017, with a peak audience of 1.3 million on July 21, 2017, followed by nine.com.au with a peak of 1.1 million on 25 July, 2017.